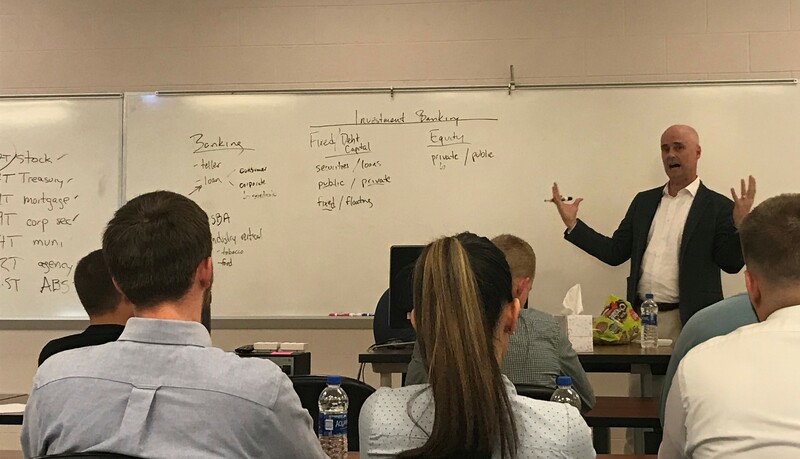 Bill Herrell, an EKU alumnus (’87) with degrees in Finance and Insurance, recently travelled back to campus for an important purpose: to offer business students insight on how to navigate a successful and rewarding career in Finance. His advice for achieving success? Be curious. Mr. Herrell gave a thought-provoking lecture in Dr. Ben Woodruff’s Principles of Investments and Financial Analysis & Valuation courses. He brought the real world into the classroom by providing examples from his career of opportunity in banking and financial markets, focusing on mergers and acquisitions. “Mr. Herrell’s overall message to ‘be curious’ was very relevant and applicable in understanding a system and making perceptive business decisions to turn a profit”, said Lorelei Nguyen, senior Accounting, Finance and Computer Information Systems major. In addition to classroom visits, Mr. Herrell spoke at the EKU Finance Society meeting. His presence at the meeting attracted record student attendance and increased memberships to the new society. “It was an honor to host Bill Herrell at our Finance Society meeting. 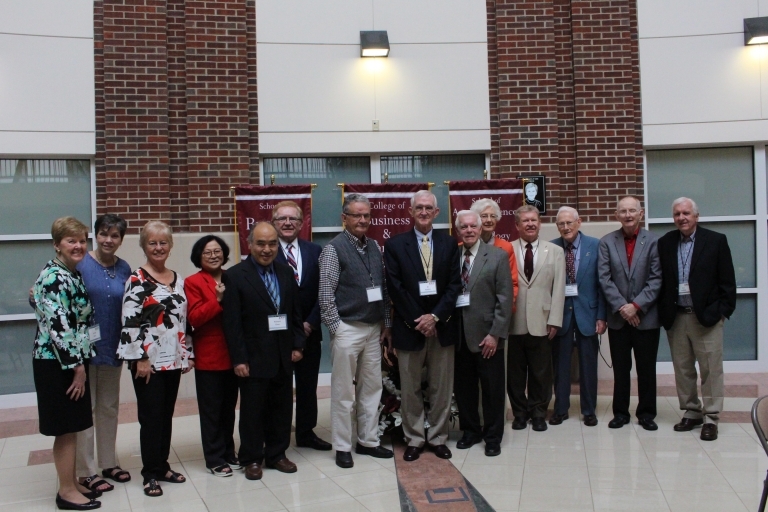 To meet someone in person who graduated from EKU and accomplished so much early in his career made a real impact on all of us,” said Quinton Lyvers, President of the EKU Finance Society. Mr. Herrell is a co-founder of The Burke Group in Atlanta, GA. Prior to this work, he was a Managing Director in the FIG banking practice at Morgan Keegan. He has worked at FSI Capital, SunTrust Robinson Humphrey and Bank of America, as well as spending six years in the insurance industry. While at SunTrust Robinson Humphrey, Mr. Herrell conceptualized and led the bank trust preferred efforts resulting in $1.8 billion in private capital transactions in eighteen months for community banks. He has been a frequent speaker for the FFIEC in Washington, D.C. and served as an expert witness on the securities industry. He has spoken at various banking industry and state banking conferences on capital raising and mergers and acquisitions. Mr. Herrell received a Bachelor of Business Administration in Finance and Insurance from Eastern Kentucky University and a Master of Science in Finance from Boston College. Mr. Herrell is a member of the EKU Banking and Financial Services Program Advisory Committee. He and his wife Connie are both EKU graduates. Connie graduated with a Bachelor of Fine Arts in 1988. They reside in Atlanta GA and have twin daughters, Jordan and Katherine.